Originally printed April 20, 2011. 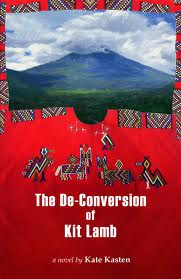 Kate Kasten's self-published novel, "The De-Conversation of Kit Lamb," provides a lesson in never judging a book by its title. I, like many other readers, approached the novel thinking it would be a thinly veiled, philosophical tract in which Kasten's anti-evangelical motivations would overshadow any literary pleasure she could possibly present to her readers. And when I learned that Kasten viewed the novel as "an alternative" to the the apocalyptic "Left Behind" novels of Tim LaHaye and Jerry Jenkins, I feared my worst expectations would be quickly confirmed. I was surprised at how nuanced the religious characters were -- even at their most dangerously naïve -- especially the 21-year-old missionary Kit Lamb and his stateside pastor. And I was downright shocked at how well Kasten captured all the evangelical code words I'd grown up with -- even to the point that Kit's eventual falling way from the faith is left open-ended enough to still fit squarely within a "born again" worldview. But I was unprepared for how perfectly early 1980s Guatemala -- under the brutal rule of real-life, born-again dictator José Efraín Ríos Montt -- would serve as a setting for a novel exploring the relationship between faith and politics. No matter how sincere Kit's beliefs -- no matter how much he has found meaning within his church -- there's no way he can reconcile his faith against the torture and other horrific acts that took place under the rule of "Brother Efraín." Kit's de-conversion, in fact, is a kinder, gentler updating of Huck Finn's blunter statement, "All right, then, I'll go to hell." After her travels to Central America and years spent researching Guatamalean history, Kasten said she was confident in her ability to tell the political-historical part of the story. But she was far less confident about her ability to write from a "born again" perspective. "I think faith is something that is so dear to people's hearts that it's not something you mess with in a hostile or confrontational way," Kasten said in phone interview last week. Kasten said "The Poisonwood Bible" came very close to accomplishing what she set out to do in "The De-Conversion," but even in Barbara Kingsolver's novel, the character of the missionary father comes across as as such "an abusive guy" that he seems more of a symbolic caricature than a character to empathize with. So Kasten decided to visit a variety of born-again congregations -- mostly from a mix of evangelical, charismatic and pentacostal denominations. "I wanted to get a sense of the language that people were using and of the feelings behind those words," Kasten said. "I got a strong sense that the people in these churches had found a wonderful community that made them feel really good. That they had found a sense of the meaning of life." Kasten's language was so accurate, however, that many of her early readers began to wonder if she was writing Christian fiction herself. That's why she eventually decided to use a title that diminishes, rather than enhances, her story. "I decided it would be OK to let readers know from the beginning where the book was headed," Kasten said. "I wanted to make sure this (de-conversion) wasn't just something that happened overnight." Kasten, who has been teaching English as Second Language at the University of Iowa for 21 years, was able pull on local expertise to make her self-published novel as eye-catching as possible. Sara Sauers, who works for the UI Center for the Book and has her own local press, designed the interior. And Benjamin Chait and of his staff artists at Chait Galleries designed the cover. The distractingly titled result is an imperfect but beautiful book, inside and out.